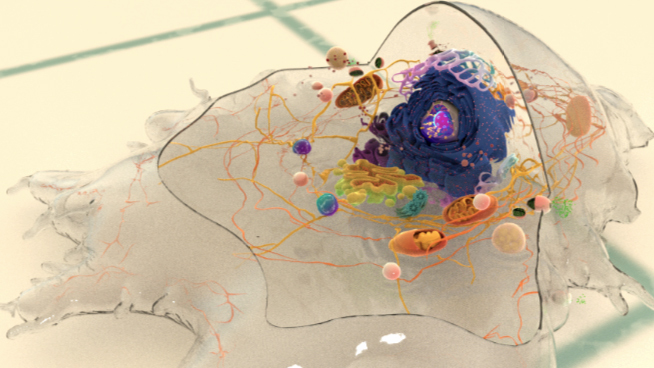 The lamellipodia and lamella are plate-like extensions of the cell that play crucial roles in both cell motility and migration, and mechanosensing. These structures form and function over distinct steps. 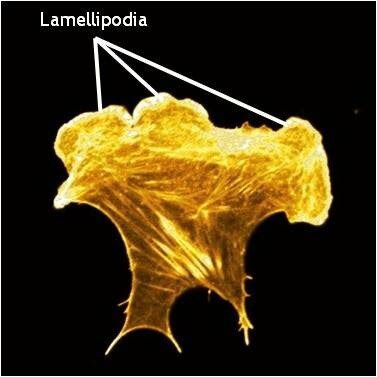 Lamellipodia are thin, sheet-like membrane protrusions found at the leading edge (front) of motile cells such as endothelial cells, neurons, immune cells and epithelial cells. These structures are generally devoid of major organelles and are instead composed of a dense and dynamic network of actin filaments. The forces generated by actin filament assembly at the leading edge induce membrane protrusion and subsequent lamellipodial growth. This has been extensively reviewed in . The lamellum or lamella (LM; plural lamellae) localizes behind the lamellipodium and is usually the broadest structure in motile cells (typically 10-15 µm wide). Consisting primarily of condensed linear actin bundles, the actin filament network of the lamella is more stable and less dynamic than that of lamellipodia  and may also resist compression. Lamellae feature stronger and more mature adhesion sites (reviewed in ) and also contain myosin II, a motor protein that is essential in cell motility.